Comments: These two prodigiously-snouted racers compete in the same Podrace in which Anakin Skywalker wins his freedom from slavery. Dud Bolt, a shameless toady, is actually paid by the nefarious Sebulba to cause accidents during the race – a job that lands him in a Mos Espa med center. Mars Guo falls victim to Sebulba's own treachery when the cheating Dug pitches a chunk of debris into his engine intake. 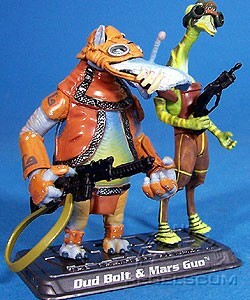 While both Dud Bolt & Mars Guo are all-new figures, their weapons are repaints of the weapons originally from Durge in the Clone Wars line.